Keylogger software is the perfect tool to reveal the truth of what users are doing in real time on your PC. Undetectable keystroke recording utility secretly captures all keyboard activities and saves recorded data in encrypted log file, which is automatically send to user specified e-mail address. Keyboard key tracking tool has the extensive solution to track keyboard activities including typed e-mails, passwords, chat conversation, text documents, typed URLs, visited websites and other keystroke activities on the Desktop PC/Laptop. 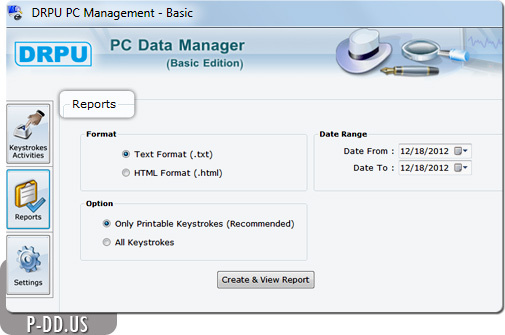 Invisible key logger utility is capable to generate the report of recorded data in text format for future use. Simple yet application facilitates systematic help menu for user’s assistance. Easy to use keylogger software is useful for home users and business organizations to detect which PC activities are taking place at behind when they are not around there. Captures all keystrokes activity details periodically at regular interval of time. Tracks typed e-mails, passwords and text document secretly. Records keyboard activity details in an encrypted log file with option to mail at specified e-mail address. Utility can be operated in standard or hidden mode. Allows you to set hot keys or run command to detect application if it runs in hidden mode. Keylogger software runs in background and does not appear in installation folder path. Simple and reliable tool provides with user-friendly GUI interface. PC monitoring utility used in Business monitoring and Parental monitoring.